Mesostructured silicon particle. Left: transmission X-ray microscopy 3D data set of one region, suggesting spongy structures. The purple square measures 8.28 microns along the top edges, which is much less than the width of a human hair. 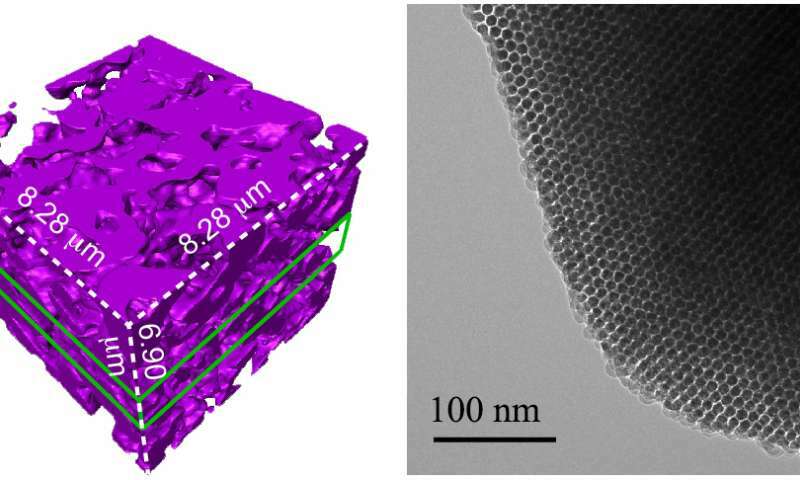 Right: transmission electron microscopy image showing an ordered nanowire array. The 100-nanometer scale bar is 1,000 times narrower than a hair. Credit: Tian Lab. The new material, in contrast, is soft and tiny—particles just a few micrometers in diameter (far less than the width of a human hair) that disperse easily in a saline solution so they can be injected. The particles also degrade naturally inside the body after a few months, so no surgery would be needed to remove them. Each particle is built of two types of silicon that together form a structure full of nano-scale pores, like a tiny sponge. And like a sponge, it is squishy—a hundred to a thousand times less rigid than the familiar crystalline silicon used in transistors and solar cells. 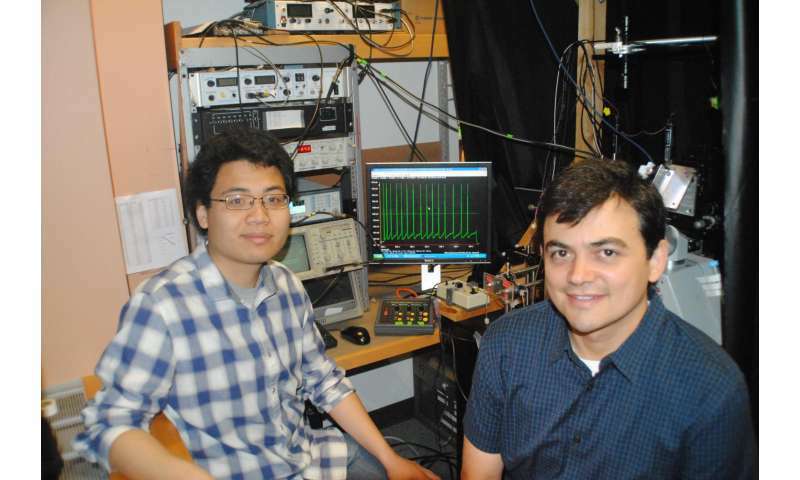 "It is comparable to the rigidity of the collagen fibers in our bodies," said Yuanwen Jiang, Tian's graduate student. "So we're creating a material that matches the rigidity of real tissue." The material constitutes half of an electrical device that creates itself spontaneously when one of the silicon particles is injected into a cell culture, or, eventually, a human body. The particle attaches to a cell, making an interface with the cell's plasma membrane. Those two elements together—cell membrane plus particle—form a unit that generates current when light is shined on the silicon particle. The scientists built the particles using a process they call nano-casting. They fabricate a silicon dioxide mold composed of tiny channels—"nano-wires"—about seven nanometers in diameter (less than 10,000 times smaller than the width of a human hair) connected by much smaller "micro-bridges." Into the mold they inject silane gas, which fills the pores and channels and decomposes into silicon.